The reality cooking competition ‘Masterchef’ has garnered such a tremendous following, that there are several countries running their own versions of the hit show. From these shows, we not only have grown to adore the passionate home cooks, but we’ve also grown to admire the judges who are renowned and celebrated chefs. 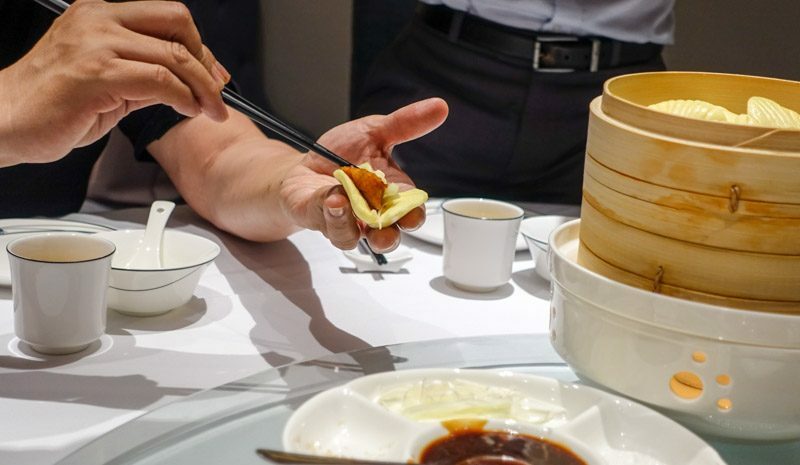 One such personality is ‘Demon Chef’ Alvin Leung, most known for his three Michelin-starred restaurant, Bo Innovation in Hong Kong and his innovative spins on humble and traditional recipes. 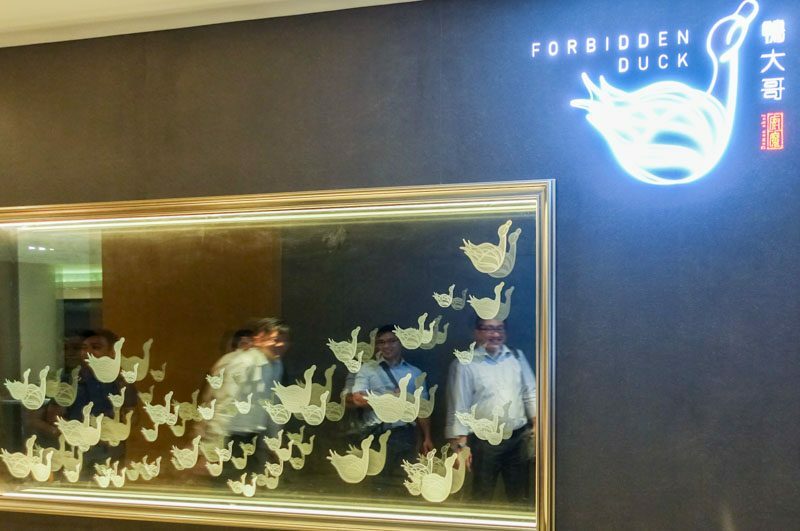 Now, we can all have a taste of his elaborate creations as he’s opened Forbidden Duck at Marina Bay Financial Centre. 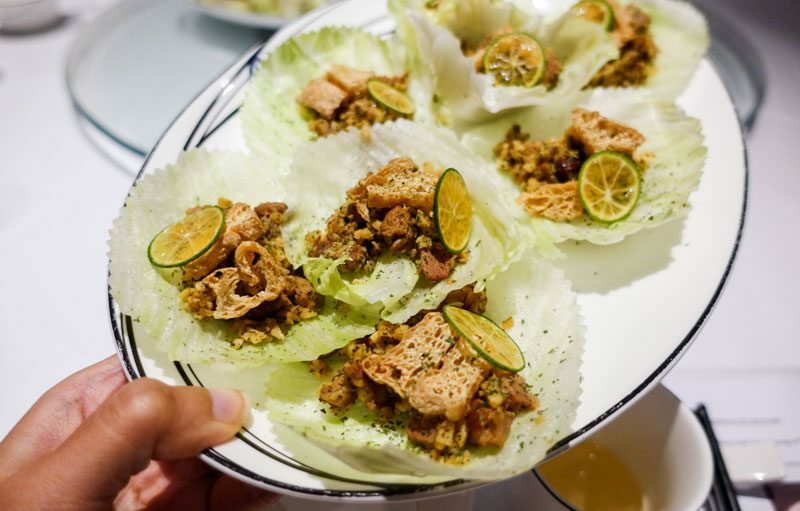 This inaugural entry into Singapore’s foodscape sees Chef Alvin paying homage to a dish that is sentimental to him. 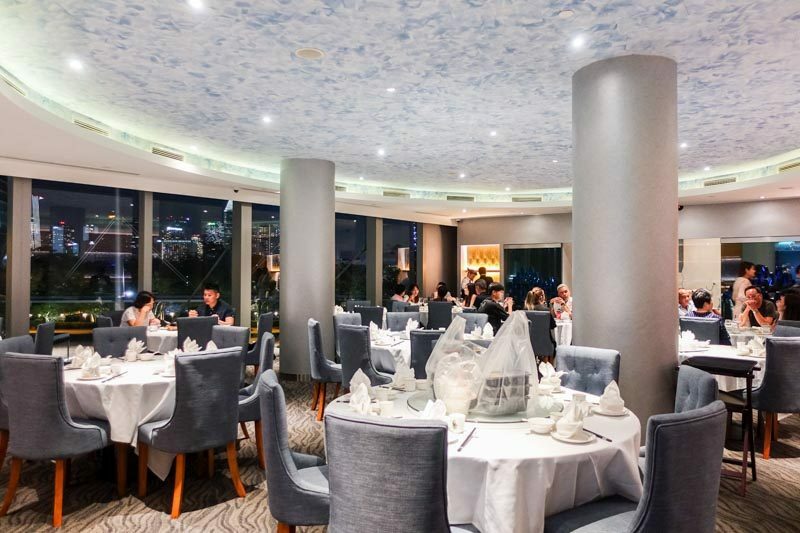 The space is very sleek and modern, and isn’t cluttered with clunky furniture like most patrons would expect of a Chinese restaurant. 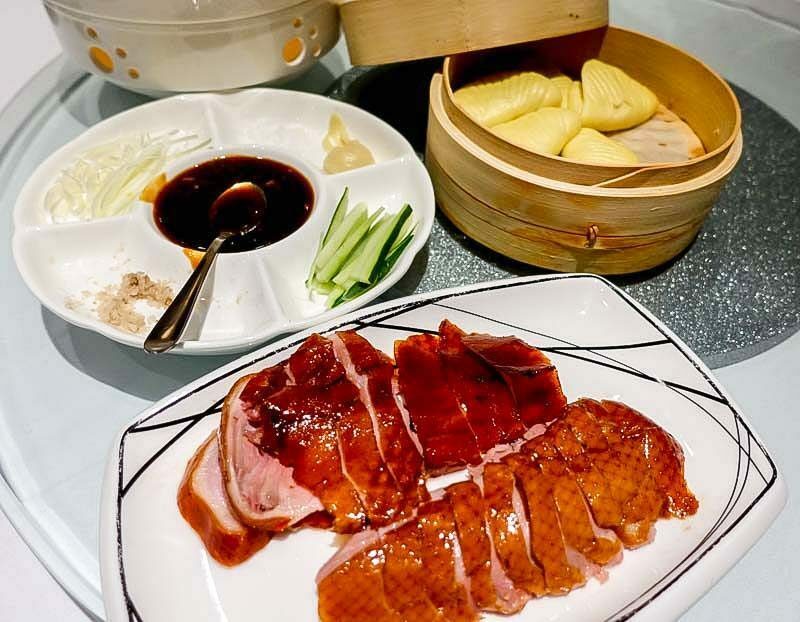 Without delay, Chef Alvin launched into the intricacies of how he selects his ducks, how he prepares the meat and how important flavours and textures are when enjoying Peking duck. The Signature Slow Roast Duck ($88) is the restaurant’s signature dish and has to be tried at least once by every diner who comes through. Chef Alvin shared with us that no seasoning is used in the preparation of roasting the ducks (which is slow-cooked for three hours, before being roasted at high temperatures in the last 30 minutes). He wants all the natural flavours to come right from the duck itself. 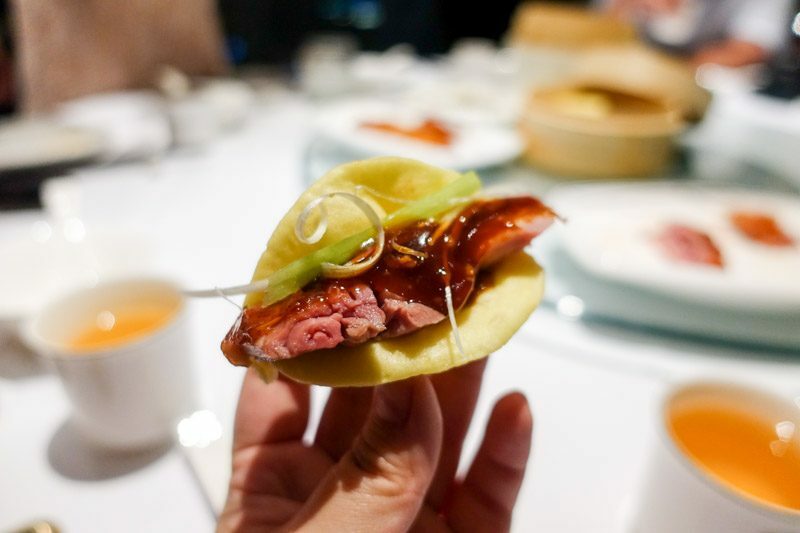 He even showed us how best to enjoy the roasted duck as he meticulously layered the meat with various condiments such as hoisin sauce with calamansi, julienned cucumber, sugar and smoked sea salt nestled in a butterfly-shaped steamed bun. The result is a pleasant combination of textures from tender to crispy to pillow-soft to crunchy. Also, the calamansi did well to cut through the oiliness of the roast duck, but not to the point of being overwhelming. The duck meat itself was juicy and if we didn’t have to share the platter amongst the whole table, I would’ve gone back for seconds. Another bite-sized delectable that Chef Alvin highly recommended was the Duck In Two Ways ($18). There are three varieties on the menu, namely Mongolian, Laksa and Original. We tried the first two. The Mongolian is made distinct by its use of cumin and chilli, so we tasted deep, savoury flavours, with a hint of smokiness. The fresh, crisp lettuce cup gave a really nice sweet finish to this morsel. The Laksa is Chef Alvin’s way of dedicating a dish on the menu to his favourite Singaporean dish, and we have got to take our hats off to him because the flavours were spot on! With the biggest difference being the use of duck meat, I could still taste the coconut, chilli and lime. However, some at our table did miss the presence of cockles, which Chef Alvin explained might be a risky ingredient to have included given its requirement for utmost freshness. 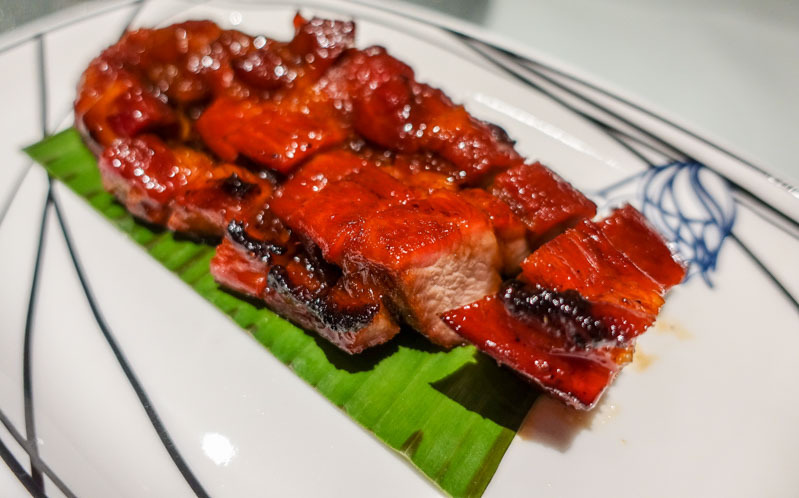 He also expressed that no Cantonese restaurant is complete without serving char siu (barbecued pork). The Iberico Pork Char Siu ($30) had a glistening coat to it, and tasted like honey and smoke. The pieces were soft, and any fat that was intact melted instantly on the palate. 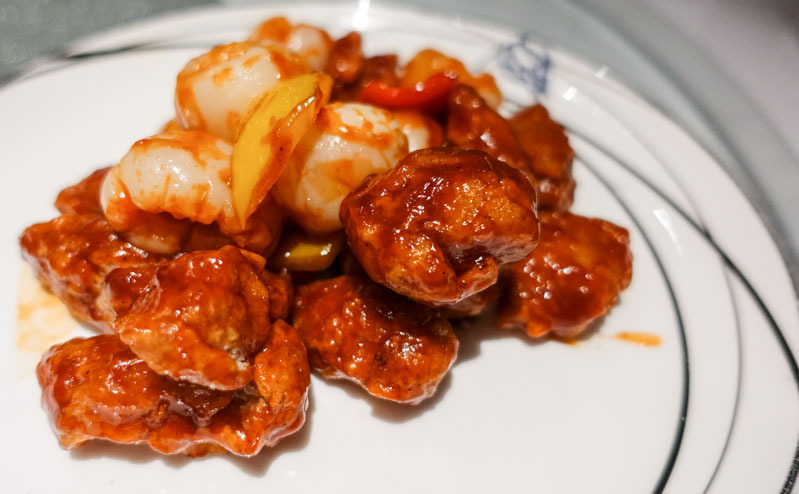 Now, sweet and sour pork isn’t a novel dish by any means, but the one here is fancy. The Sweet & Sour Pork With Lychee, Rose And Hawthorn ($22) is spritzed with rose and lychee spray before being served, which was intriguing to observe. But does it come through on the nose? It was hard to tell, really. 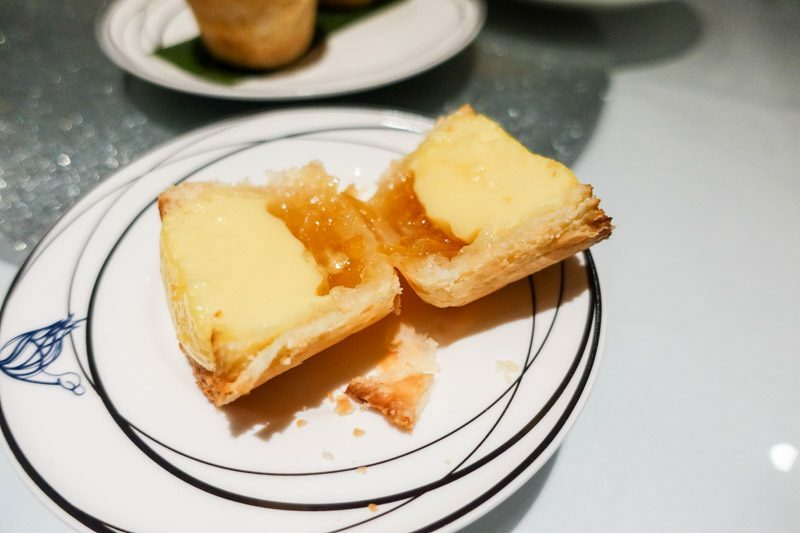 The sweet and sour flavours were quite potent that they masked any hint of rose and lychee, but as a dish on its own, I must say it was very flavourful and well-balanced, while maintaining that little bit of crunch despite being drenched in sauce. Looking for a dish to impress your dining guests? 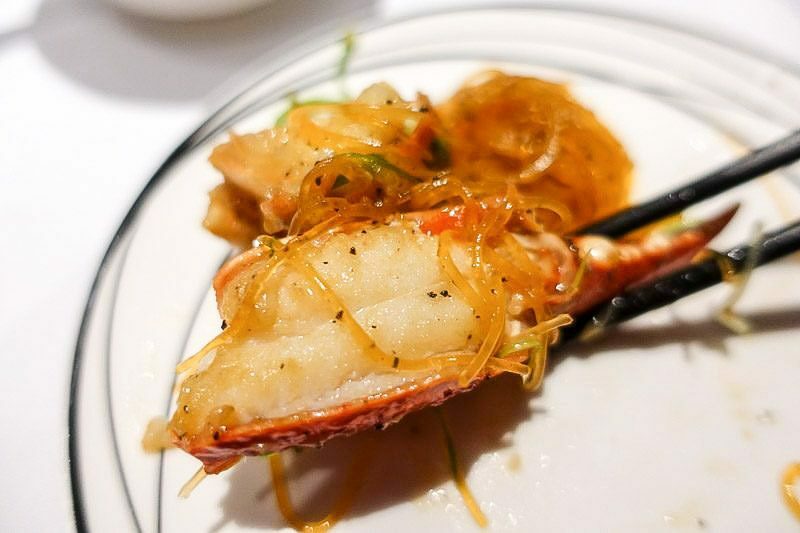 Order the Lobster And Vermicelli With Black Truffle Har Mi XO ($88). 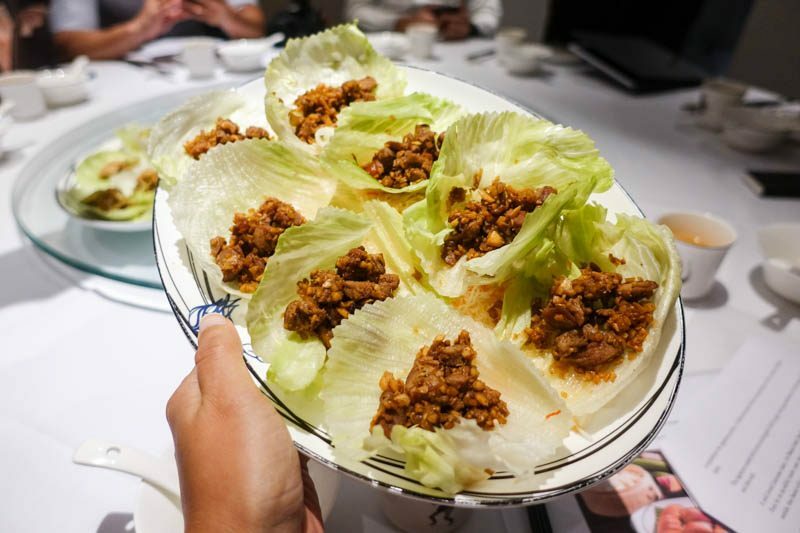 Doused in homemade XO sauce and black truffle, one can easily catch a whiff of this dish the moment it’s brought into the room. 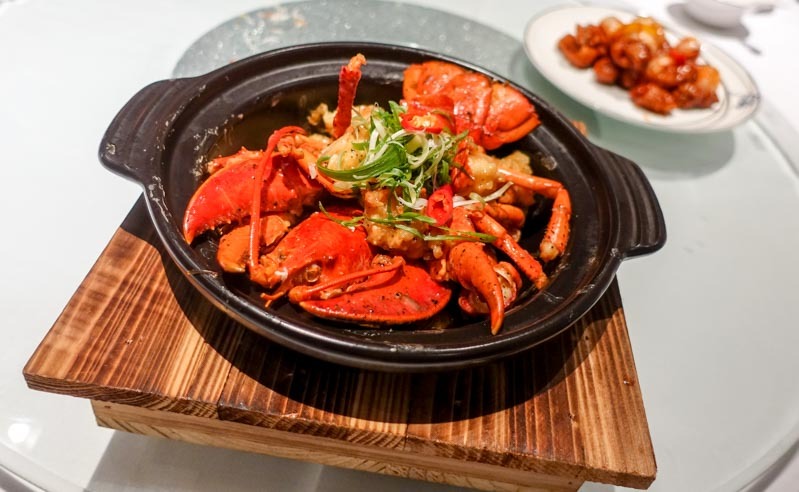 The flavours were extremely savoury and slightly peppery, while the flesh effortlessly tore away from the shell. I definitely felt like I was being spoilt at that moment, because there’s almost no chance I would have the opportunity to have lobster cooked that extravagantly any time soon. This dish was the highlight of my evening, not because it was the best tasting, but because it was simply very interesting. Chef Alvin’s least favourite local dish is cereal prawns, so as way to go against the grain, he’s come up with his own interpretation of it. 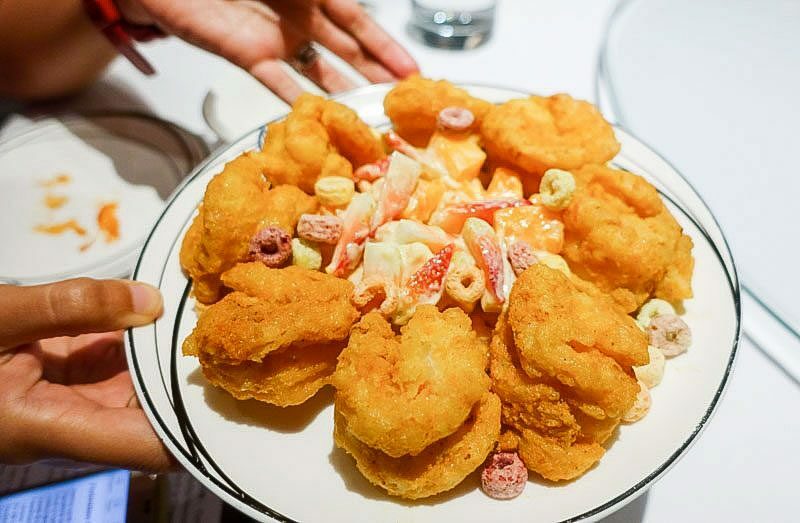 The Golden Cereal Prawns ($30) features large, plump prawns coated in salted egg batter, served with a scattering of Kellogg’s Froot Loops and wasabi fruit salad. Does it work? Let’s just say, you’ll either love it or hate it. But I do have a nostalgic bond with Froot Loops (read: I used to eat Froot Loops for breakfast every day as a kid), so I could be slightly biased. 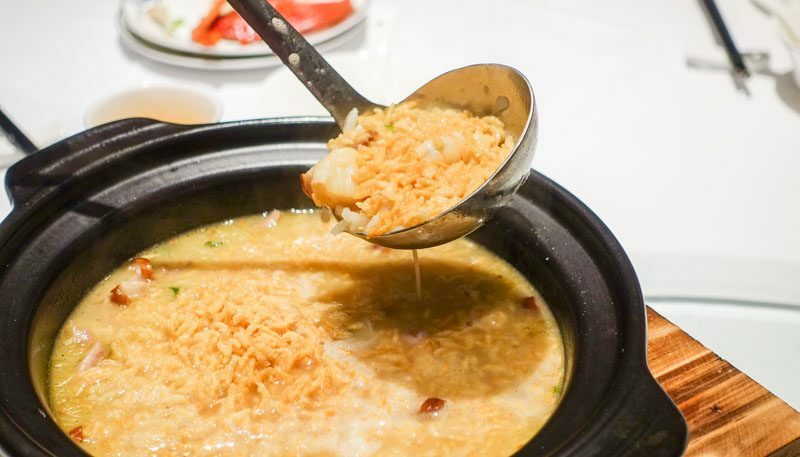 And here we have the ultimate winner of the evening – the Seafood Rice In Aromatic Duck Soup ($32, serves two to four pax). Simply from sight, it may not look appealing, let alone appetising. But Chef Alvin informed us that, to make the soup, he uses all parts of the duck so there’s plenty of depth and richness to its flavour. 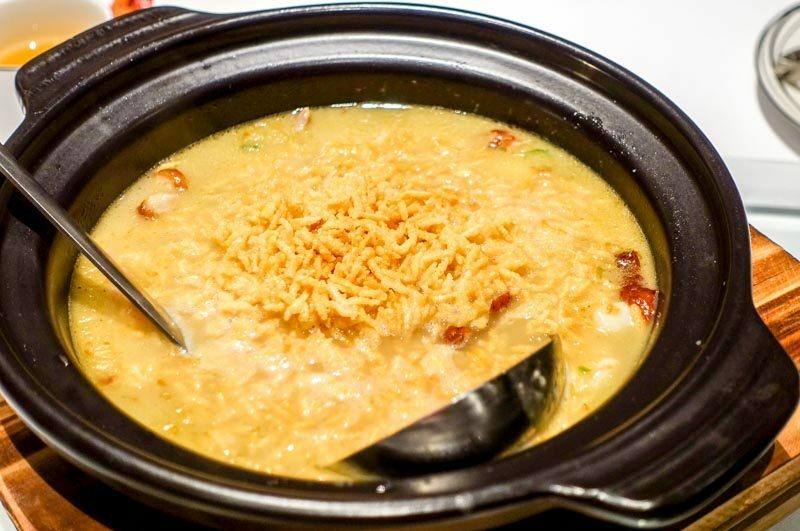 For someone uninformed about the cuisine, I honestly was quite excited to try this as I’d heard that it’s a comfort dish for many Cantonese families. Right from my first spoonful, I was hit with a sense of calm, like a hug from an old friend. 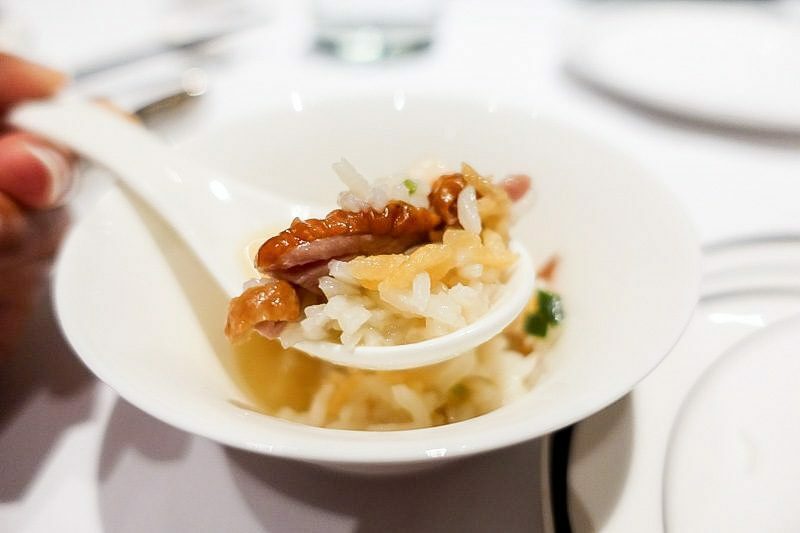 The consistency was akin to porridge, but made complex with the addition of the duck meat crispy rice. The contrast in texture was rather delightful and I couldn’t bear to finish my portion, to be honest. I would hands-down, return here solely for this on a rainy day if I were hungry and in the vicinity. 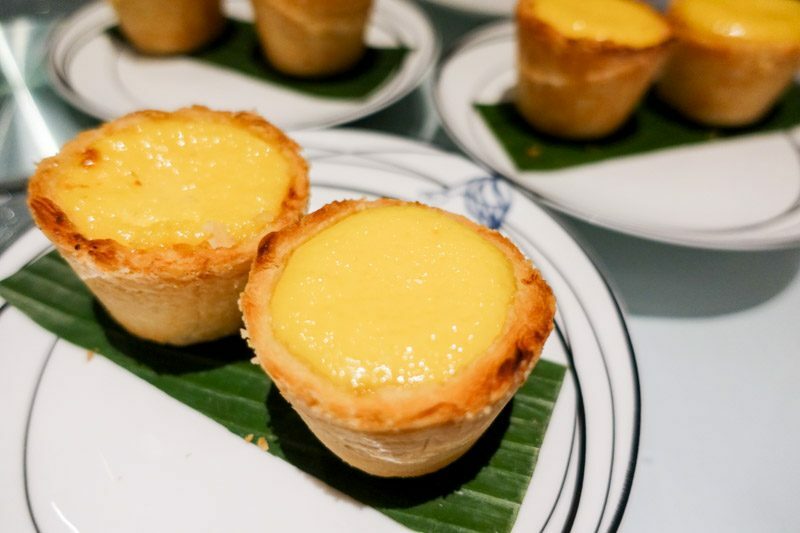 The end of the meal was near, and Chef Alvin rounded up the evening by earnestly telling us how quickly diners have taken to his Giant Egg Tart ($6). He would have diners specifically request for several takeaway orders once they’re done with their meal. What makes them special, however, lies within the tart itself. 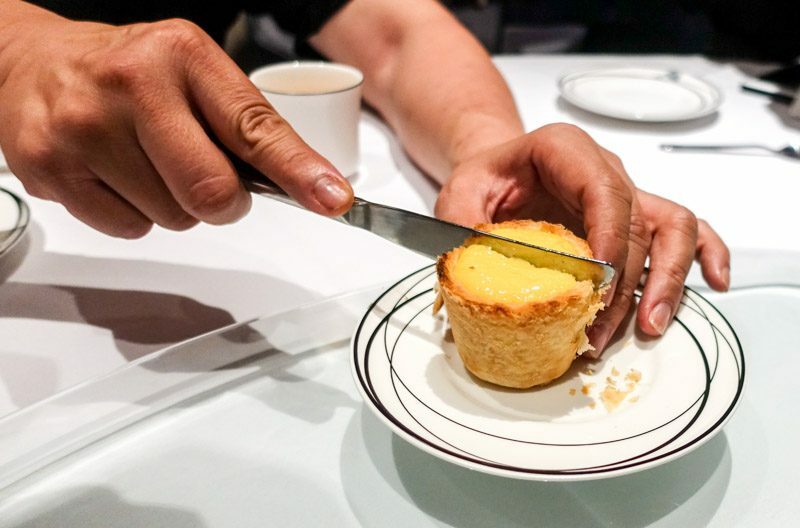 He so gracefully demonstrated to us how we should best enjoy this delicate pastry, and revealed a lava centre filled with yuzu. The taste was as satisfying as I would’ve expected, and the crust complemented the egg curd with its buttery crumble. I don’t blame diners for wanting to take home these gems for an impromptu snack. Leaving the Forbidden Duck, I felt very fulfilled — not just with food, but with a sense of satisfaction from now knowing more about the man who fills people’s television screens. Chef Alvin’s dishes, at least to me, surround familiarity, nostalgia and tradition, with just the slightest edge of newness. Like I said before, there was one dish I would return for, so let’s hope my schedule brings me to the Marina Bay area soon, and hopefully, it’ll be a day where I can find an excuse to warm my belly while I seek refuge from the rain.